This method of paper bowl construction allows you to recycle and preserve a memory at the same time. The first step in making this type of paper bowl is to shred the papers you have collected. 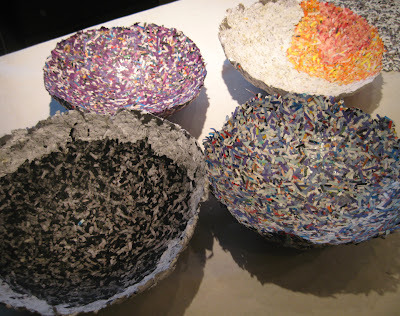 The shredded fibers are mixed with a binder and molded onto a bowl mold. 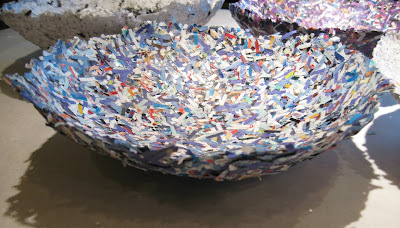 You can use random papers for a crazy-quilt colorful bowl or you can collect and shred papers specific to a concept. For example, let's say you have a lot of extra money lying around. You could shred the money and make a very cool ( and expensive-lol!) money bowl. I have a teacher friend who just retired and wants to make a bowl out of her shredded lesson plans! Bring your paper and shred it right in the workshop and then fashion your original paper bowl. There's also plenty of papers on hand to use if you do not have your own. Class fee: $30.00. All materials included except the special papers you might bring. For many years, artist Robin Mackintosh has been one of our featured artists at our Holiday Gift Open House. She has created charming jewelry and ornaments using the fascinating technique of needle felting. 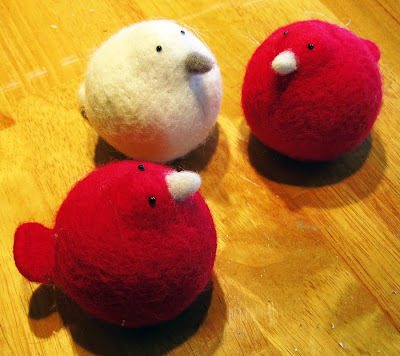 Here's your chance to learn some great tips from Robin as you make your own needle felted birds. Class fee: $35.00. All materials included. Dense foam insulation can make an excellent mold for casting concrete. 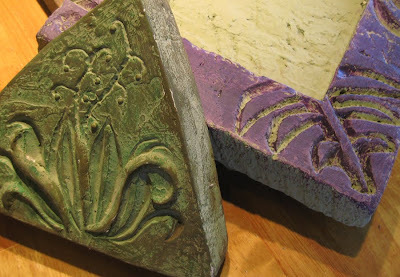 In this workshop you will learn how to cut, carve and fashion an original mold and cast a decorative concrete garden stake to ornament a focal point in your garden . Class fee: $40.00. All materials included. Dense foam insulation can make an excellent mold for casting concrete. 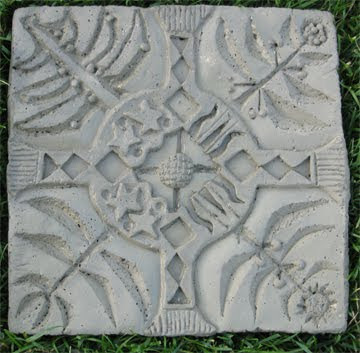 In this workshop you will learn how to cut, carve and fashion an original mold and cast a concrete garden stepping stone. Class fee: $40.00. All materials included. 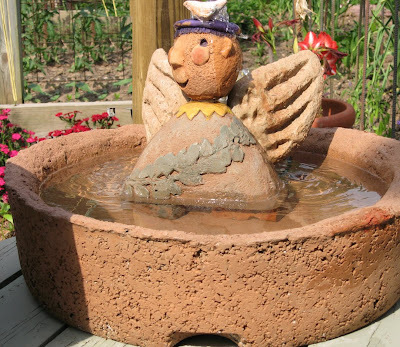 The sound of bubbling water is soothing and adds a great dimension to your home and garden. In this workshop, you'll make a container to hold water and a simple fountain sculpture from hypertufa and concrete. We'll also discuss the various pumps available and how to put together and plumb your fountain. Class fee: $45.00. All materials included.